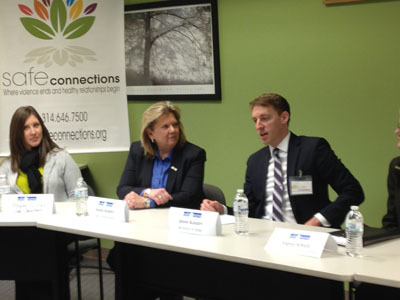 Missouri Secretary of State Jason Kander visited Safe Connections December 12 and thanked St. Louis leaders for providing access to the Safe at Home program for women who have been abused. Leaders from local domestic and sexual violence agencies including the St. Louis Metropolitan Police Department and the St. Louis City Circuit Attorney’s Office shared thoughts with Kander on their efforts and how they use the Safe at Home program. More than 1,000 participants are currently being protected through this statewide program that provides a confidential mailing address for those who, for their safety, need to ensure they aren’t located by their former abuser or stalker. Learn more about the Safe at Home program here. Safe Connections provides advocates who can walk you through the enrollment application process. Call our Crisis Helpline at 314.531.2003.